For those of you in NYC! 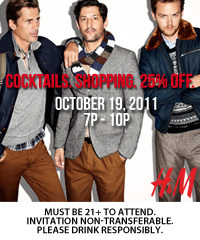 Party with Thrillist at H&M’s Grand Re-Opening. Guests will get 25% off their entire purchase all night long (word to Lionel), and the first 100 guests to spend $200 (after discount) will get two exclusive tix to the Versace for H&M pre-shopping party. As guests romp through four freshly redesigned floors of modern classics, they’ll jam out to a live DJ, grub on tasty bites, sip mouthwatering cocktails, gain knowledge from professional stylists, and score candy treats from cigarette girls, who promise to be smoking hot, but not terrible for your health. Drop your deets at http://thrillist.com/HMBash to experience the Grandest. Re-Opening. Ever.